After hearing Delta Tunnels opponents and proponents testify regarding whether or not they believe the Department of Water Resources new plan to build the project in two phases is a changed project, hearing officers for the State Water Resources Control Board on February 8 postponed a critical hearing needed to implement the project. Hearing officer Tam Dudoc announced the first day of Part 2 of the process would be delayed until February 22, beginning with the evidentiary portion of Part 2. Dudoc also directed the petitioners, the Department of Water Resources (DWR) and the U.S. Bureau of Reclamation, to respond to the Natural Resources Defense Council, et al.’s February 7, 2018 renewed motion for a stay of the hearing, as well as the other comments and issues raised during the hearing that day. She gave the petitioners until 5:00 PM on Friday, February 9, to respond. Dudoc also set a deadline of 12:00 noon on Tuesday, February 13, for all other parties to respond to the petitioners’ forthcoming submittal. The Water Board is currently considering the petition by the DWR and Reclamation to change the points of diversion of the Central Valley Project and State Water Project required for the building of the two massive tunnels under the Delta. After months of talk and speculation, the California Department of Water Resources (DWR) on Wednesday announced plans for a two-stage implementation of Jerry Brown’s controversial Delta Tunnels project, also known as the California WaterFix. In a letter to water agencies, Karla Nemeth, DWR Director, said the option for the first stage includes two intakes on the Sacramento River in the North Delta with a total capacity of 6,000 cfs per second, one tunnel, one intermediate forebay and one pumping station. The second stage would consist of a third intake with 3,000 cfs capacity, a second tunnel and a second pumping station. This would bring the total capacity of the project from 6,000 cfs in the first phase to 9,000 cfs capacity in total, a volume of water that would exceed the entire volume of the Sacramento River during low flow periods, according to Nemeth. Doug Obegi, the Natural Resources Defense Council (NRDC) attorney, was pleased with the decision. “The hearing officers are taking this seriously and I greatly appreciate their consideration in doing this,” he concluded. 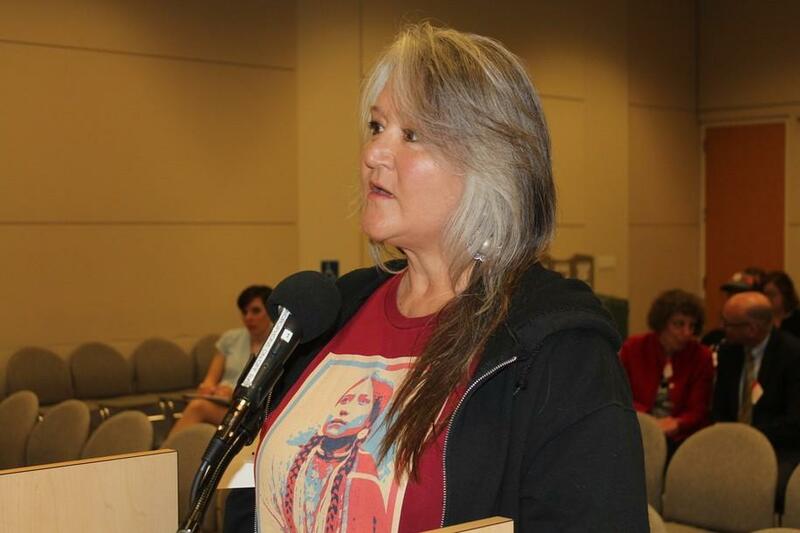 During the public comment period, Pennie Opal Plant of Idle No More SF Bay urged the board to reject the petition required to build the California WaterFix. A large number of other Delta Tunnels opponents, including representatives of Restore the Delta, North Delta Cares, Friends of the River, the Center for Biological Diversity, Sacramento Valley water districts, Delta farmers, business owners, fishing groups, San Joaquin, Sacramento and other Delta counties and the City of Stockton, spoke on behalf of the motion to stay the hearing and against the California Water Fix. Councilmember and Vice Mayor Elbert Holman of the City of Stockton said the California WaterFix would undo years of investment that Stockton has put into meeting state water quality standards. By choosing not to mitigate the adverse impacts to the water quality of 300,000 residents, DWR is treating the Delta’s largest city like “second class citizens,” he stated. Project opponents say the project would hasten the extinction of Sacramento River spring-run and winter-run Chinook salmon, Central Valley steelhead, Delta and longfin smelt, green sturgeon and other fish species, as well as imperil salmon and steelhead populations on the Trinity and Klamath rivers. No Comment to " Water Board Delays Delta Tunnels Hearing Until Feb. 22 "